Antonio Banderas is mainly known as a film star. But he has done musicals. Nine was his only time on Broadway and it was very successful. He was nominated for a Tony. Then he returned to films. He was born Jose Antonio Dominguez Bandera Aug. 19, 1960 in Malaga, Spain. He was in the Spanish National Theater until he was spotted by director Pedro Almodovar. And it's his work in Almodovar's films especially Tie Me Up! Tie Me Down! that got Hollywood's attention. Banderas' first big film was The Mambo Kings in 1992 followed by Philadelphia. We found out he could sing in the film version of the musical Evita. And that's what got him to Broadway. 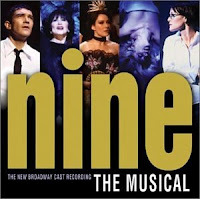 Nine was written by Maury Yeston based on the Federico Fellini film 8 1/2. It was first produced on Broadway starring Raul Julia in 1982. The 2003 revival was very successful. It won two Tonys and Banderas was nominated. It was also turned into a 2009 film starring Daniel Day-Lewis. Banderas plays the lead character based on Fellini. There is a cast album available on CD. Banderas returned to films. His most significant role since then was as Puss In Boots in the Shrek films and the Puss In Boots spinoff. He also reunited with Almodovar in the 2011 film The Skin I Live In. These days he stars in genre films that could best be described as B movies. So I think Banderas' days as a big star are over. He was a star when he did Nine. Here's Antonio Banderas performing Guido's Song from Nine on the 2003 Tony Awards broadcast.